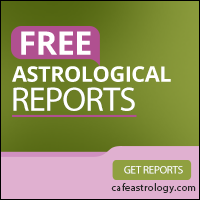 The following tutorial aims to demonstrate how to use and understand the Free Natal Chart report found on Cafe Astrology’s free report section. I am assuming that you know how to read the sign and planetary symbols for this tutorial. 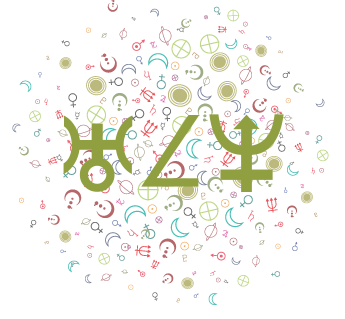 If you don’t, then please refer to the symbols here: Astrology Symbols: Signs and Astrology Symbols & Glyphs. You might also benefit from learning about the polarities or opposite signs here: Polarities: Opposite Signs and Houses. If you need help understanding how the houses are arranged in the natal chart, see Understanding the Astrological Chart Wheel. I use various random charts for illustrative purposes, including one with data: January 1, 2000, at 12:00 PM, in New York, New York. This is the default chart (although there is no default location) in the Free Report Section here. Elsewhere, I have addressed the issue of duplicated and missing signs as well as planets in signs that don’t match the signs on the house cusps. Here, I explain various charts and tables in the report. Please note, however, that you don’t have to know how to read the tables to understand the report since each factor listed in the table is listed and interpreted in the report/analysis. 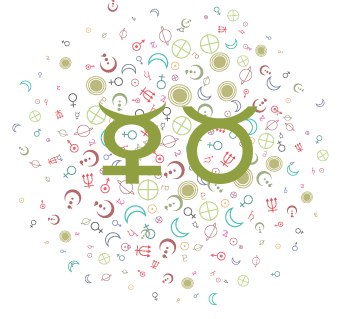 Above, on the left side of the table, you’ll find the listing of planets in the natal chart and their positions by sign and degree. Circled in green, for example, is the position of the Sun. Here we see the Sun is in Capricorn at 10 degrees and 35 minutes. 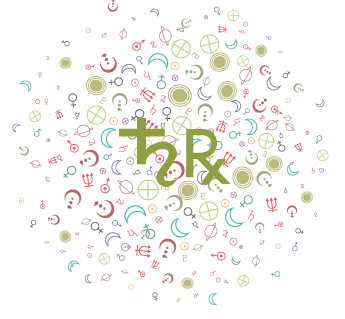 On the right side of the table (or directly below if you’re on mobile or a small screen), you’ll find the positions of the houses in your natal chart. 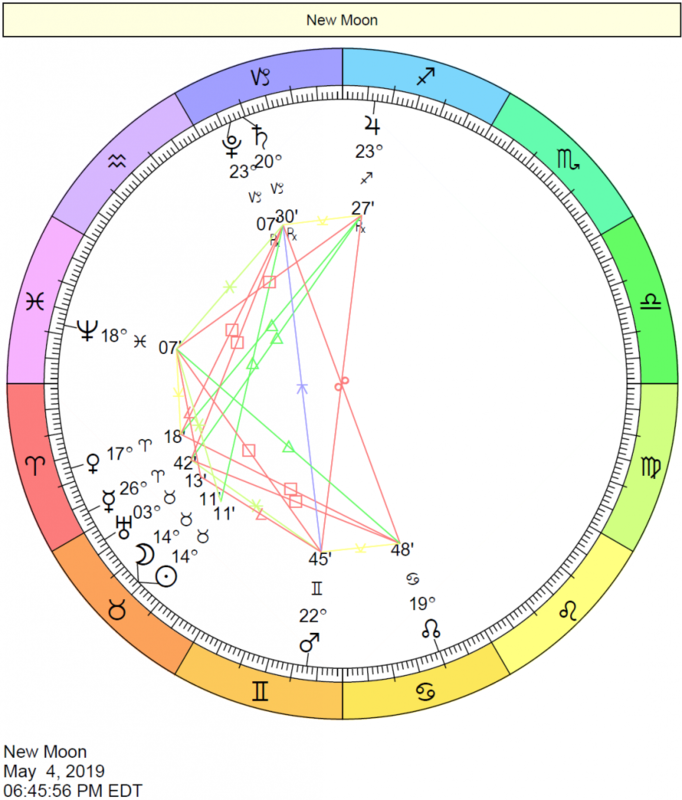 This does not appear if the unknown birth time option was selected to create the chart since these positions cannot be determined without a fairly accurate birth time. Circled in pink above is an example house position. The Roman numeral VII represents the 7th house. In this example, the seventh house of the chart begins at 7 degrees and 39 minutes of Libra. Note: All of the placements in the table above appear in your report. 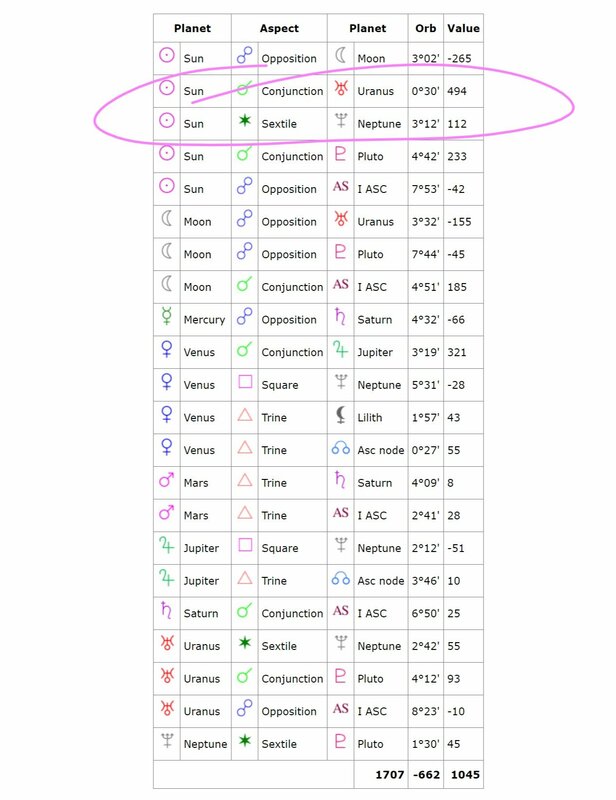 For example, you’ll see Jupiter is in Aries from the table above, and in the report below the tables, you’ll find the listing Jupiter in Aries along with an interpretation. In the above table, you’ll find the list of major aspects found in my natal chart. 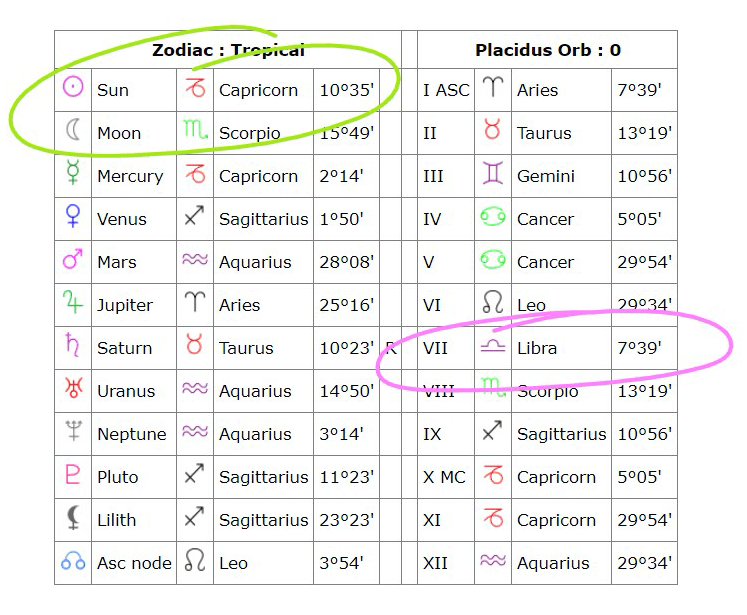 Two of the aspects are circled in the pictured aspect table. The first is Sun conjunct Uranus. The value in the “orb” field next to this aspect is 0 degrees and 30 minutes which is very close. The orb value reveals how far away an aspect in your chart is from exact. In the very rare case that an aspect is exact, the orb would be 0 degrees and 00 minutes. In this example for Sun conjunct Uranus, the orb is less than one degree– it’s zero degrees and 30 minutes which is one-half of a degree, and this is considered a very close orb. Any orb that is less than one degree means that the aspect is very close or tight, and considered strong. A conjunction aspect by definition occurs when two planets or points are 0 degrees apart, but we allow some room–or an orb of influence–under which we consider these planets/points as conjunct. Different astrologers allow different orbs, but if we were to allow a 7-degree orb, for example, then planets that come within 7 degrees of one another would be considered as connected by a conjunction, or we would say that they are conjunct. In the value field, you’ll see a relatively high number, 494, on the Sun conjunction Uranus aspect line. This number is a relative weighted value that aims to illustrate whether or not an aspect might be considered strong, and in which direction (negative or positive). This value can be positive or negative, reflecting the nature of the influence (whether it’s generally considered harmonious or challenging). It’s meant to show how strong the aspect might be, and is based on the planets or points involved (inner planets are more personal, for example, and might get a higher score, while outer planets are less so and are more generational in influence, and thus their aspects may not score as highly) as well as the closeness of the aspect to exact (the smaller the orb, the tighter the aspect, and the stronger it’s expected to be). 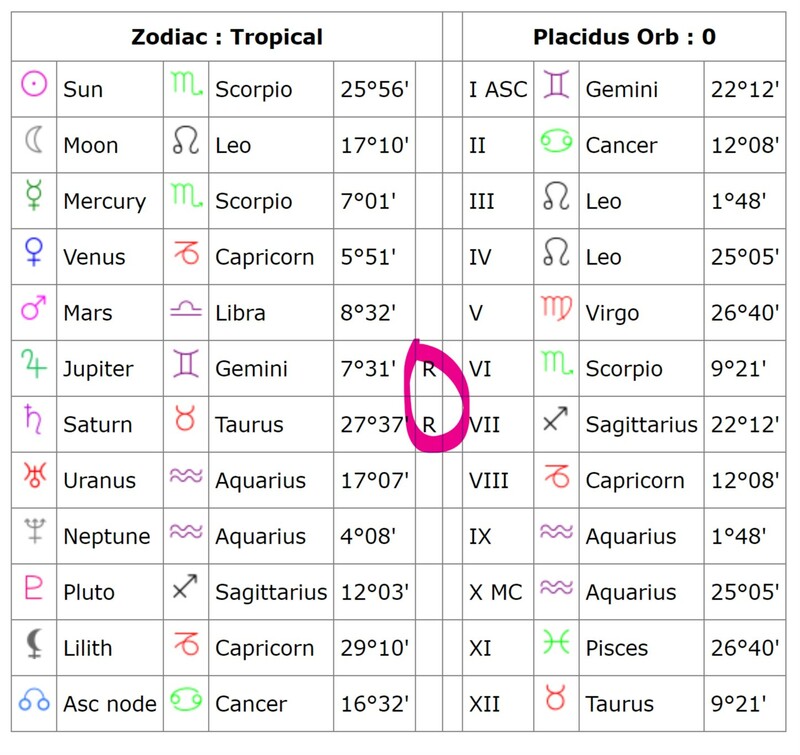 The second aspect circled above is Sun sextile Neptune. Since it involves the Sun and is thus highly personal, it receives a higher value straight away. However, the aspect is a sextile and is not especially close in orb, so its weighted value is less than the Sun-conjunction-Uranus aspect, weighing in at 112 instead of 492. If the aspect were a conjunction or square, or even a trine, the weighted value would be higher. It would also be higher if the orb was lower, which would mean the aspect was closer to exact and thus stronger. So, the Sun sextile Neptune remains an important aspect but may be more subtle than the Sun’s conjunction to Uranus in this particular chart. While the orb is a mathematical value, the value score is a subjective one. Not any one aspect can be considered wholly bad or good since a person can work with its energies in constructive or destructive ways. 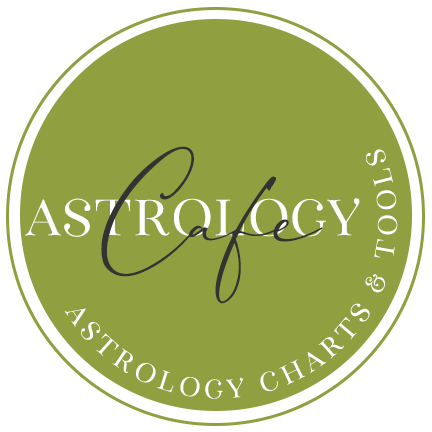 Astrologers use many different methods of determining the overall weight of an aspect that are not factored into these weighted values. For example, the planet that’s often considered the chart ruler (the one that rules the sign of the Ascendant) may be given more weight than another planet, and this wouldn’t be factored in here. Even so, these weights can help us quickly home in on aspects that are likely to have more strength than others and can be quite useful as long as we keep our minds open. In the above example, final values are circled at the bottom of the table. These are totals of the positive values in the aspect chart, totals of the negative values in the aspect table, and then a sum of the two. 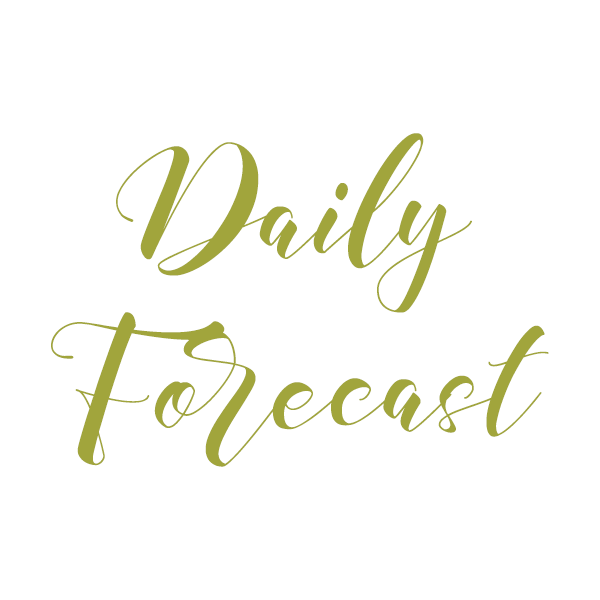 In the example above of my chart’s aspects, you’ll see that there are more positive influences than negative, and with the total values guide, we get a general sense of how much so. There isn’t any particular number or score that suggests a good or bad chart, but these values can be useful for comparison purposes. In the example above of a different chart altogether, you’ll see higher values although the distribution is similar (the final value is about 70% of the total number while in the example above this one, it was closer to 60%). 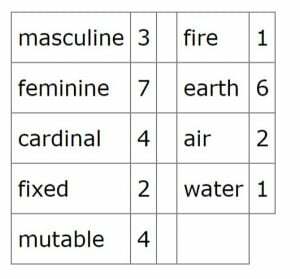 In the above example table, you’ll see the counts of the major luminaries and planets in signs for this particular chart that are masculine and feminine, as well as the distributions of signs in the elements (fire, earth, air, and water), and in the modes (cardinal, fixed, and mutable). Masculine signs are: Aries, Gemini, Leo, Libra, Sagittarius, and Aquarius. Feminine signs are: Taurus, Cancer, Virgo, Scorpio, Capricorn, and Pisces. Cardinal signs are: Aries, Cancer, Libra, and Capricorn. Fixed signs are: Taurus, Leo, Scorpio, and Aquarius. Mutable signs are: Gemini, Virgo, Sagittarius, and Pisces. Fire signs are: Aries, Leo, and Sagittarius. Earth signs are: Taurus, Virgo, and Capricorn. 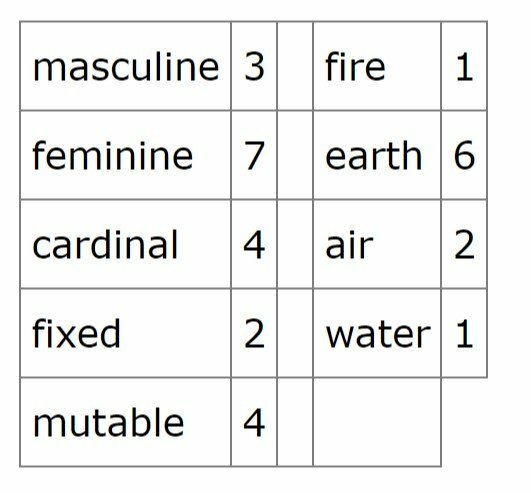 In the example here, there are considerably more feminine than masculine signs represented. There is also a preponderance of Earth signs. Please note that these include the signs of the Sun, Moon, Mercury, Venus, Mars, Jupiter, Saturn, Uranus, Neptune, and Pluto only. There are of course many other bodies that can be analyzed in a chart, but it’s not worthwhile to tally up counts for all of the asteroids, centaurs, mathematical points, parts, and so forth, as they can skew things unnecessarily and detract from your analysis. Pictured above is a table of the house positions of planets in houses. 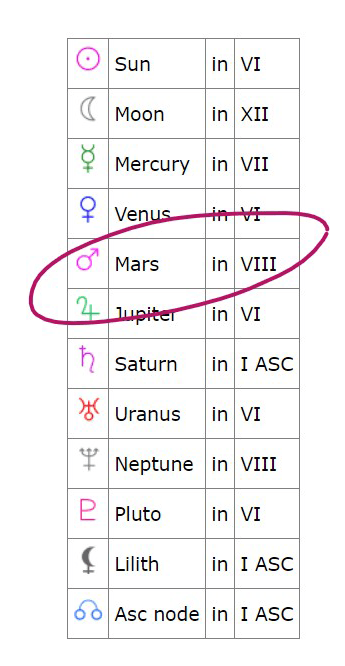 For example, circled above is Mars in VIII which means that, in this chart, Mars is in the 8th house. This factor is listed and interpreted in the interpretative report on the same page, as are all other factors listed here. Note that “Asc node” is the North Node of the Moon. 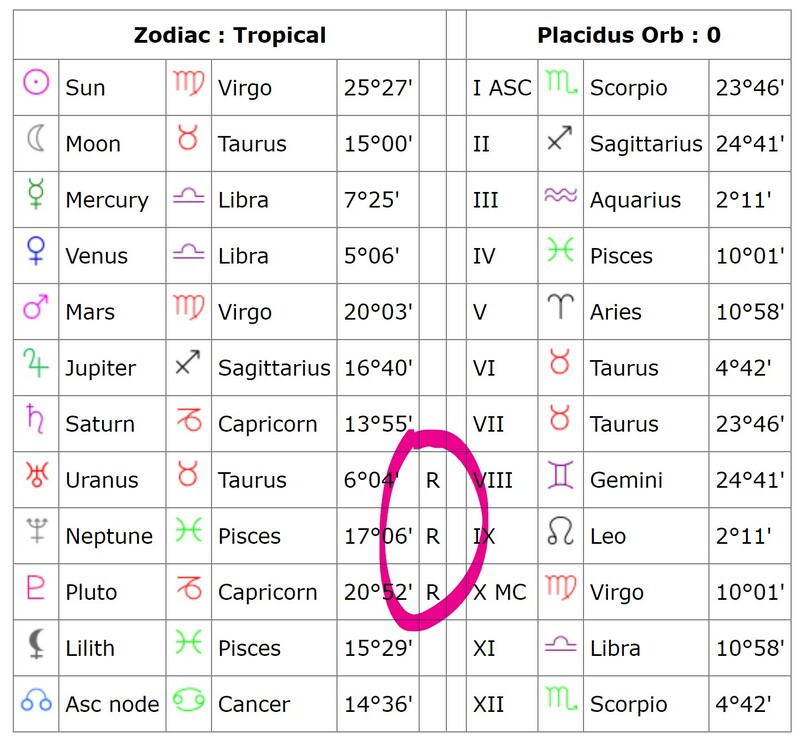 In the above example, you can find this person’s retrograde planets by identifying the R next to the planet. Above, Uranus, Neptune, and Pluto are retrograde. Note that these bodies spend many months each year in retrograde motion, so finding the outer planets retrograde in a chart is common. In the above, Jupiter and Saturn are retrograde. The other listed points are NOT retrograde. Note that the Sun, Moon, and Ascendant cannot be retrograde. Black Moon Lilith is the Mean value of the point. 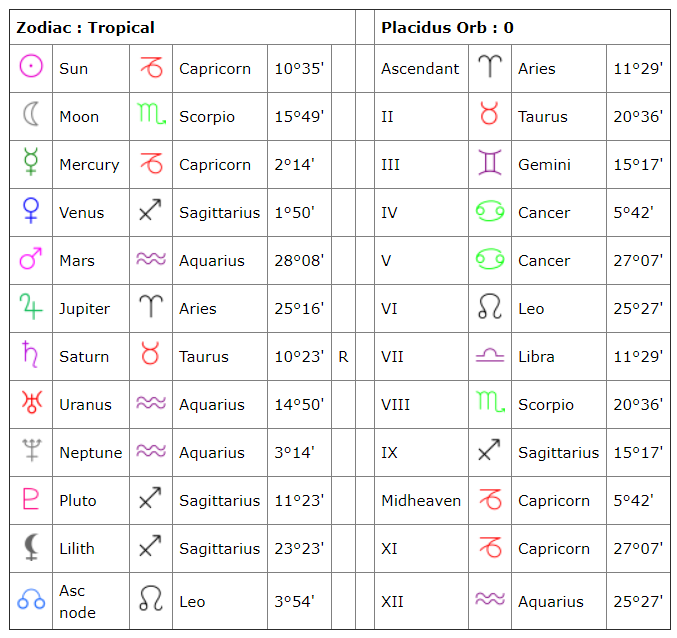 A note about the included planets and points: Because many people learn astrology (and many other subjects such as nutrition and psychology) in unconventional ways these days, they may not have a good grasp of the basics before studying additional points and topics. There are people who learn about an obscure asteroid before they learn about the basic planetary positions, and wonder why it’s not included in the list. This kind of learning is not necessarily wrong or ineffective–and it’s something we have to get used to–but it certainly helps to recognize the value of learning the basics before moving onto specialized topics. There are people whose interest in astrology is sparked by an article about the Black Moon, for example, and this is great since it drew them in to look a little further, but they may not yet grasp that the Sun, Moon, Mercury, and so forth are far more important than the Black Moon. 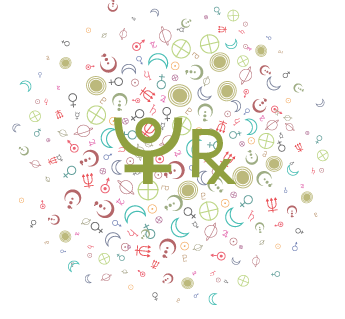 In truth, people can learn astrology in a far less chaotic manner if they take things one step at a time and try not to skip too far ahead. It’s much like if someone were to begin a math book at chapter 22 and then skip back to earlier chapters later – they can learn in this manner, and in fact they may not have taken interest in the subject if it weren’t for that chapter 22 topic, but it makes sense to check out the first chapters at some (hopefully early) point so that they can understand and appreciate later chapters more fully. For these reasons, it’s important to first understand the positions of the basic planets and points listed in the tables above before considering the additional points. These are things you should learn first and well before moving on. I love additional points, parts, and so forth, and have had a lot of fun with them and gained insight from them over the years, but I suggest getting a strong understanding of the basics before adding the asteroids, hypotheticals, and other points to your analysis.